I feel like I know these Derby horses better than any year since probably 2007. As the posts were drawn today, I shivered with excitement. I like this feeling! I think the draw was pretty fair. Horses who most likely wouldn’t factor got non-factor posts, ie, Daddy Long Legs – I love it when international horses come over here, but the Derby is really a different animal from any of the big stakes overseas. As Godolphin painfully learned over a decade of trying to win it, the Derby is a stubbornly American race. 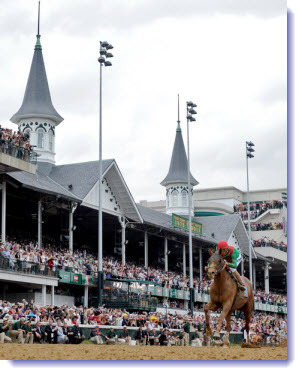 Horses must be prepped in the states to be competitive, to experience the unique pace, surface and riding style that is commonplace in the Derby. I hope Daddy Long Legs runs well, but I don’t see him winning. Liaison, the “other Baffert”, drew post 20. I like Liaison, but his 2-year-old form hasn’t progressed to 3, and I am not really sure why he’s here. Of course, he could win the whole thing, as “other” horses are wont to do (Thunder Gulch, Real Quiet, Super Saver, Charismatic…). It doesn’t help that he’ll be breaking from the parking lot, though. Bodemeister has gotten some flack for being “inexperienced” since he didn’t race at 2. He has run 4 times in 2012, more than Union Rags and Take Charge Indy, and he has run at Oaklawn Park on its biggest day, which draws huge crowds. Curlin only ran 3 times before making the Derby, and I don’t think he had to face a horse like Creative Cause in a stretch duel. Breaking from post 6, Bodemeister has a great chance of busting a 130-year old jinx. Hansen has been the most entertaining horse on the Derby trail. He is a Type-A standout in color and attitude, and with a brassy, frontrunning style to match. It was a delight watching his owner, Dr. Kendall Hansen, react to the post position draw when he knew Hansen wouldn’t draw the #1 (he got post 14). Sure, the blue tail idea turned into a fiasco, but the “Hansen Girls” with their own blue tails & matching peep-toe heels were a fantastic diversion. Dr. Hansen has truly enjoyed every minute of owning the horse Hansen, and I hope someday to do the same with my own race horse. It won’t be hair dye, but I can totally see a winners’ circle ritual involving Elvis-style shades & curled lips! I am having a hard time settling on a top horse. That’s why I am so glad I can make multiple 50-cent Tris with different combinations! I have liked Union Rags since the Champagne. He is a magnificent specimen, with chiseled physique and always an alert look of intelligence. Also, his owner, Phyllis Wyeth, is a cool lady. Union Rags has been unable to show his talent in clutch situations, however – his BC Juvenile run wasn’t enough to pass the tiring Hansen, and in the Florida Derby, he lacked the kick that impressed everyone so much in the Fountain of Youth. Union Rags has started a pattern this year of grand runs followed by flops – the Derby is on his “up” slope. He will start from post 4. Gemologist and Alpha are the two I can’t separate. Their Wood Memorial was a clash of titans, with Gemologist fighting out the win. Alpha has been plagued with minor setbacks and a sort of indecisiveness from his connections – two strikes against the son of Bernardini. Gemologist is a brilliant athlete (plus I like his name!) but he had a long layoff after his KY Jockey Club win in November. I see these two as winners, but with an edge to Gemologist. Daddy Nose Best has been my top closer all year long. He has a grit and grind that will be valuable in the stretch at Churchill, and I definitely see him hitting the board. He has inhaled the track in the mornings, always a good sign. My other closer candidate is Daddy Nose Best’s stablemate, Sabercat. Sabercat was impressive in the Delta Jackpot last year, navigating traffic on the backstretch and closing sharply to win. He is return races haven’t been stellar, but he looks to be rounding into form for a huge effort Saturday. How great would it be for longtime trainer Mike Harrington to score a Derby with Creative Cause? The big grey colt has run like so many other “almost there” closers – he runs brilliantly sometimes, but gets into trouble in others. In a 20-horse field, I don’t trust luck to keep him out of a mess. Don’t let anyone fool you – with Trinniberg, Hansen, Bodemeister and Take Charge Indy all in this race, the pace will be fast. Finally, I really hope it doesn’t rain this year!! !